The technique for aspirating sperm from the male, and using that sperm for ICSI and IVF in the female, was actually invented by Dr. Silber. This procedure involves direct aspiration of sperm from the husband combined with the injection of a single weak or nonmoving sperm into the cytoplasm of each of the wife’s eggs. We routinely perform this procedure for patients who have congenital absence of the vas, or for those in whom there is no possibility of surgical repair or for those with severely poor sperm production. Men with no sperm at all in their ejaculate can now have their own child, because sperm can be retrieved from their testicle or epididymis and injected into their wives’ eggs. The highest pregnancy rates with this approach and the least pain and discomfort to the male require that these sperm retrieval procedures be performed microsurgically, and not with either crude needlesticks or gross surgical techniques. Even when there is no sperm whatsoever in the man’s ejaculate (azoospermia), there is now a very good chance for pregnancy using our sperm retrieval and ICSI procedures. The techniques of sperm retrieval and ICSI were originally developed by us in Brussels, Belgium, and in St. Louis, Missouri. There are two types of azoospermia, obstructive and non-obstructive. Obstructive azoospermia can be caused by vasectomy, congenital absence of vas, poorly performed hernia type surgery, or epididymal scarring from prior infections. We have been able to reverse vasectomy for many years with over 90% success using microsurgery. However, when the obstruction is irreparable, the man’s sterility, until recently, had been considered hopeless. In cases of obstructive azoospermia, sperm aspiration with ICSI will give the same chance for getting pregnant as any couple with a normal sperm count undergoing IVF. We can micro-inject a single retrieved sperm directly into the substance of the egg and get normal fertilization. Virtually all (with some rare exceptions) of the couples in whom epididymal sperm are present have transfers of good embryos. 46% per each treatment cycle get pregnant and have a baby. Those who don’t carry a baby still have a 46% chance if they try a second time. Virtually all couples have enough sperm to be frozen and stored. This frozen sperm can then be used at a later time in conjunction with another IVF/ICSI procedure for the wife. Thus, the husband does not need to undergo any more sperm aspiration procedures after the first one. The babies from ICSI are healthy and genetically normal. There are many different approaches for trying to retrieve sperm from the testes of non-obstructive azoospermic men (TESE, which means “testicular sperm extraction”). Some of these approaches, such as needle biopsy or multiple needle biopsy (TEFNA), have a low success rate for finding the few sperm that are being made within the azoospermic testicle. It is like trying to find a needle in a haystack by blindly thrusting a pitchfork into it. This is not a nice way to treat a man’s testes, but it is also fraught with failure. A similar approach which is given a more civilized name is called “testicular mapping.” This approach is just as blind as TEFNA, but at least a record is kept of which of up to 30 or 40 blind needle sticks (if any) into the testicle actually find sperm. But the truth is that subsequently following this “map” often results in the drawing of a different and contradictory map. So blind needle sticks, no matter what you call it, yields an unsatisfactory success rate for non-obstructive azoospermia, and can indeed even be damaging. A microsurgical approach is far more successful, but if performed incorrectly or with a non-physiological premise, can be highly destructive, and result in considerable loss of testicular tissue. This is the case with the so-called “microdissection” technique popularized in New York under the completely mistaken guise that it conserves testicular tissue, when in truth instead it does the opposite, and it actually destroys the testicle. With this destructive “microdissection” approach to TESE, a large horizontal incision is made in the outside shell of the testis (called the tunica albuginea), which only exposed one of the eleven anatomic lobules of the testis. This incision makes no anatomic sense if you are trying to sample the entire testis to find the few sperm it is producing. So then the “microdissection” surgeon basically opens up the entire inside of the testis, turning it inside out to look at every single cubic millimeter of the testis, which plays complete havoc with its blood supply and causes massive intra-testicular swelling and subsequent fibrosis. The proper way to do the microsurgical TESE is what I would call the “anatomic stem cell” approach to micro TESE. Firstly, the incision in the tunica albuginea should be vertical rather than horizontal, so as to expose peripherally every one of the eleven anatomic lobules. There is no reason even to penetrate into the interior of the testis. 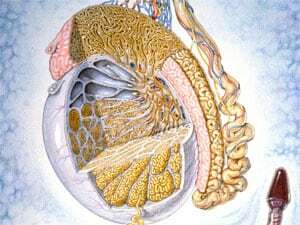 If you look at the well established diagram of intra-testicular microanatomy, you can see that all testicular sperm producing tubules traverse from the inside of the testis to the periphery and then back again to the inside. If there are any spermatogenic stem cells anywhere in the patient’s testis, sperm will be found in the periphery of that tubule. 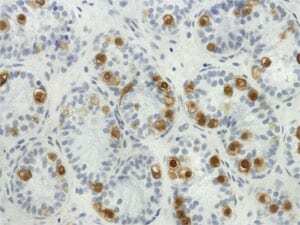 Spermatogenic stem cells may be very few in men with non-obstructive azoospermia, and there are over 300 tubules in those eleven anatomic lobules. If there is a single spermatogenic stem cell in one of those tubules, it will propagate that one tubule and sperm will be found on the periphery without having to damage the testicle at all. Stem cell approach. Sample all anatomic lobules peripherally. With a single elegant vertical (rather than horizontal) incision, all anatomic lobules can be exposed without invading the inside of the testicle, and doing no harm to it. Spermatogonial stem cell approach to non-obstructive azoospermia. The purpose of the microsurgery is not to dig around the inside of the testicle on a fool’s mission, but to stop the microscopic bleeders on the periphery with pinpoint accuracy, and to close the tunica albuginea with microscopically thin sutures in order to prevent reduction in testicular volume with subsequent pressure atrophy. With such an “anatomic stem cell” approach, microsurgical TESE will give the best success in finding sperm for ICSI, and also will cause only miniscule loss of testis tissue, and NEVER result in testicular atrophy and eunuchism. Normal testis anatomy. Stay on periphery, but expose every anatomic lobule. Perfect microsurgery: stay on periphery for maximum number of sperm. The New York microdissection operation as opposed to our micro-TESE stem cell based procedure. The anatomic stem cell approach to microsurgical sperm retrieval does no harm at all to the testis, but the so-called “microdissection” procedure is devastating to the testis. With the microsurgical approach we advocate, under local anesthesia, a full inspection is made of every anatomic lobule on the periphery of the testis, without any “digging around” inside as is done in the New York “microdissection” approach. So we find any sperm that might be “hiding” in the testis, without doing any harm. It is also dramatically less expensive, and you can just get up and walk away painlessly when it is finished. With the New York “microdissection” technique, the following tragedy is common: see the photo of what the testis looks like after a New York “microdissection” procedure. Note that most of this man’s testis has been replaced with a scar inside, and he is no longer even producing testosterone, let alone any sperm. So in summary, male infertility treatment, short of IVF and ICSI, should be limited to microsurgery for azoospermia, and careful thought has to go into making your choice of where to go for such treatment.